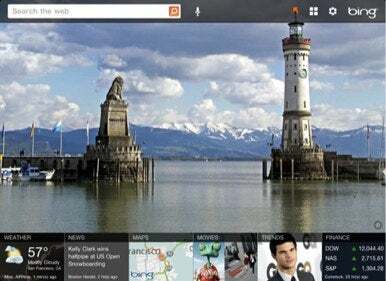 “Just Bing it” may have failed to catch on with the public’s search vernacular to date, but Microsoft’s most recent attempt to bring its search engine to the masses has culminated in the release Bing for iPad. Not to be confused with Bing—a separate app for iPhone and iPod touch—this new entry gives Microsoft’s “decision engine” a native app that can take advantage of the iPad’s more expansive screen real estate. The core Bing search services are all here in their iPad-centric glory, including Web, news, movie listings, and local businesses, and just like on the iPhone app, you can type or speak your queries. Bing for iPad can also help you stay on top of the weather, stock quotes, popular searches, and, of course, the service’s unique and often informative Homepage Image. Integration of Bing Maps covers location and navigation territory, but it sounds like the mass transit directions from bing.com/maps got left behind for this 1.0 release. Location-based check-in integration with Facebook and Foursquare, which the iPhone app enjoys, was also left out. Interestingly, Microsoft appears to have been influenced by the likes of Flipboard and TweetMag, as news and trending topics can be displayed in “rich magazine-inspired layouts.” You can take Bing for iPad for a spin as long as you’re running iOS 4.2 or later, and the free app won’t even cost you a dime.